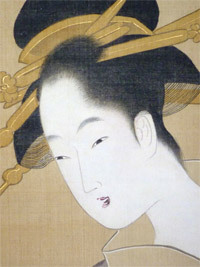 Excessively rare bust portrait of the courtesan Hanahito of the Ogi-ya. 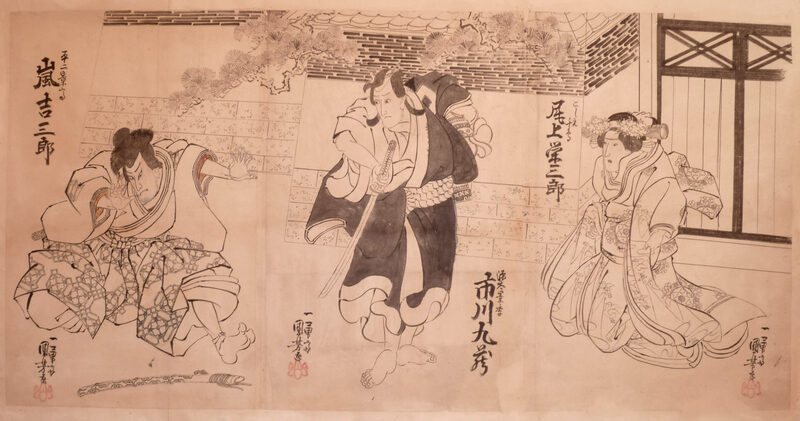 The Doll Festival from a set of the Five Seasonal Festivals published by Maru-ya Bun’emon, c.1798. The British Museum impression of this print is illustrated in Ukiyo-e Masterpieces in European Collections, no.205. Very good impression and colour. 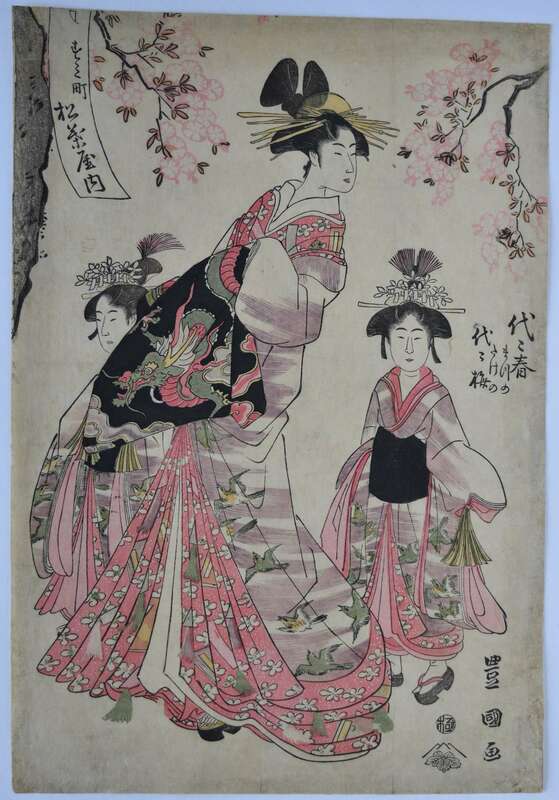 Slight soil and creasing but overall a nice example of this uncommon artist’s work. Signed Ichirakutei Eisui ga.
A fine original painting by one of the best known Ukiyo-e artists. 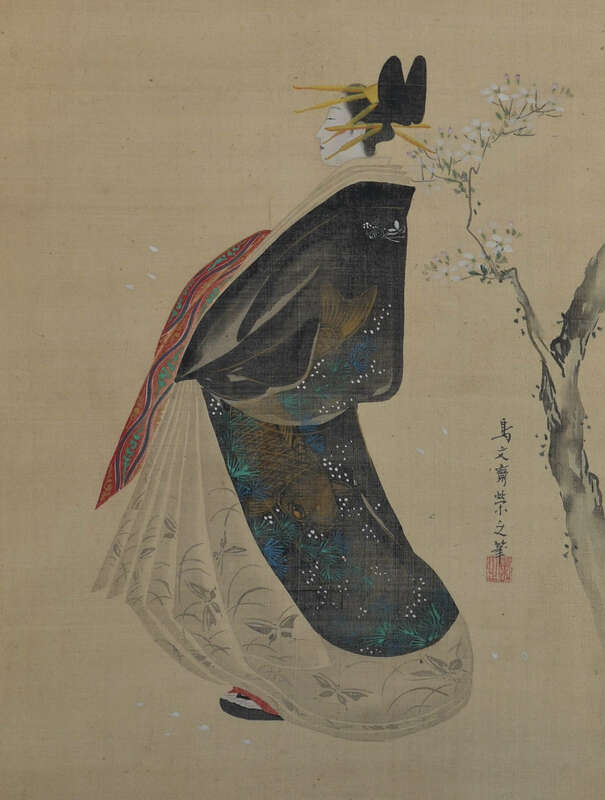 This high ranking individual produced some of the most refined prints during the late 1780s and the 1790s. He had many pupils including Eisho, Eiri and Eisui. Shows a standing beauty painted c. late 1790s. 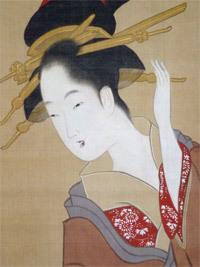 One hand adjusts a hairpin, while the other holds a partly concealed letter. 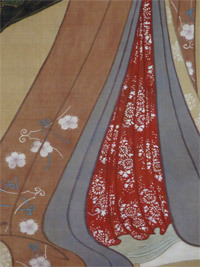 Image size 35.25 x 13 in; 89.5 x 33 cms. Exquisitely painted in full colour on silk. 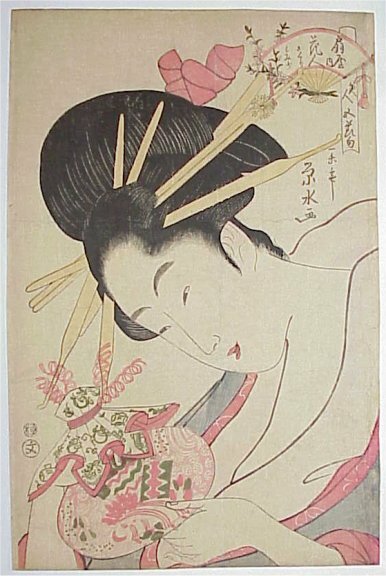 In very good condition with futo-maki ( thick wooden roll to preserve the painting from damage ) and fine new mount and box. 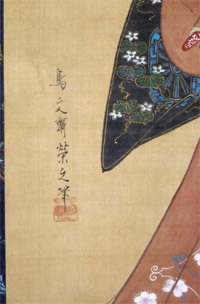 Signed Chobunsai Eishi hitsu with Eishi seal. 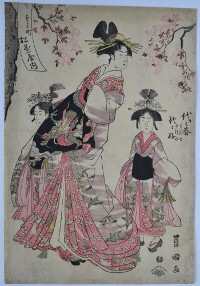 A triptych representing Matsukaze, “The Wind in the Pines,” Chapter XVIII, from a set of triptychs Furyu yatsushi Genji, “Genji in Modern Dress.” Brandt, Hosoda Eishi, Stuttgart, 1977, lists nine from the series (this being no. 58, p. 116, illustrated p. 16). 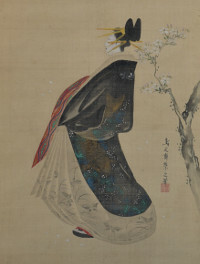 Based on the famous early 11th century novel Genji Monogatari written by Murasaki Shikibu. 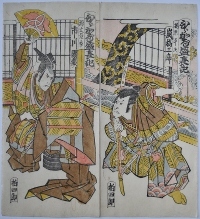 Shows court ladies, one playing a koto on the engawa far right, others welcoming the arrival of Prince Genji, far left. 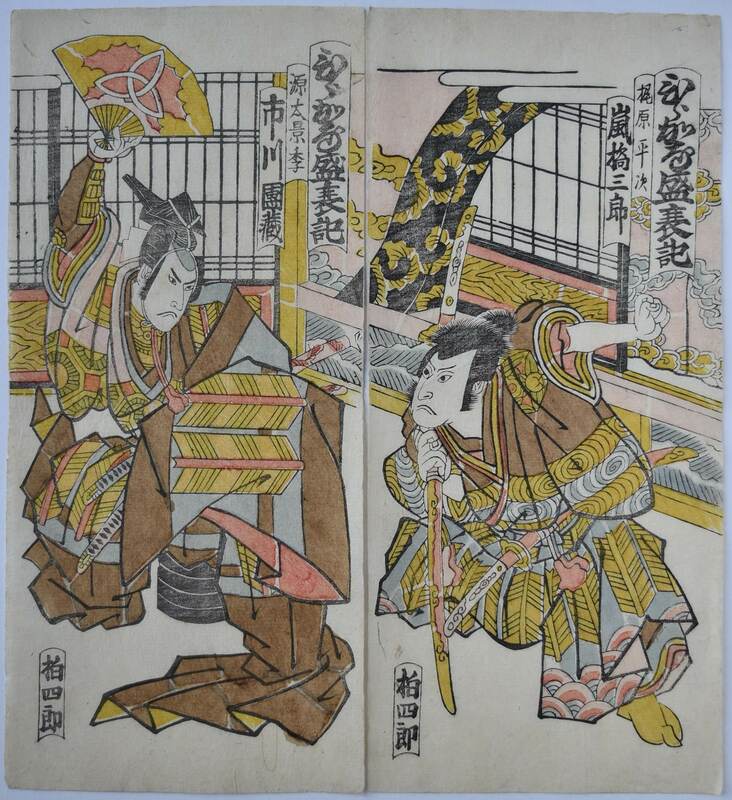 Published by Senichi, c. 1792. 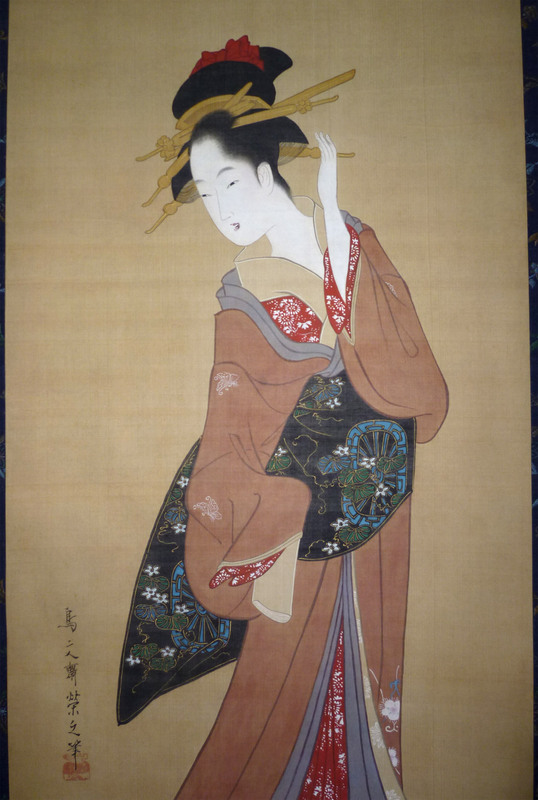 Provenance: Ex Worcester Art Museum and Louis W. Black collections, sold Sothebys N.Y., 4/3/1976, lot 122. Extremely fine impression and perfect unfaded colours. Album backing, otherwise fine condition. Signed Eishi ga (with a small sumi insertion to read Eisui).